If you want the look of stretched ear lobes but don't want the time and hastle of actually stretching your ear lobes then here is a neat solution. 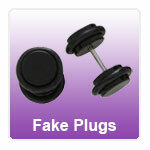 These fake flesh plugs can be used in your sstandard ear piercing and can give you a stretched look of upto 10mm. They are available in a range of materials and styles to suit every taste. Our fake flesh plugs can fool most people that you have finally stretched your ears but with the advantage that you can remove them and wear normal studs. "The quality of the jewelry is exactly what I was hoping for.And the service was excellent the people were great to deal with"
"Fast delivery and great products." "FINALLY! Jewellery that fits perfectly and looks great. I've been trying to find a nose stud that fits well for months. Everything i've had before..."